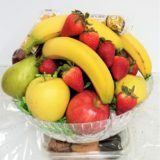 Fun fresh fruit and snack gift basket! 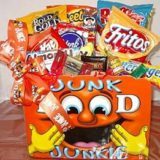 Loaded with seasonal fruit, chips and candy bars. 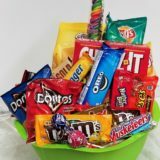 Fruit Snacks and more fill this fun gift basket for a delightful surprise. 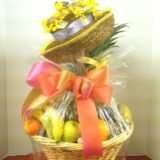 Fresh fruit, hand selected by Tina, bring the fruit snacks gift basket to a level of sophistication. Adding the fresh fruit means your recipient can enjoy not only the snacks but also a little bit of healthy fruit. 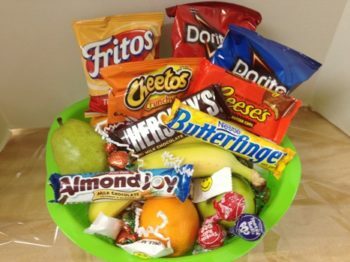 The snacks include chips, nuts, candy bars and more. 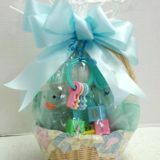 Each gift basket designed by Basket Express is unique. The fresh fruit is hand selected seasonal fruit, which varies from time to time. Most fresh fruit gift baskets include apples, oranges, pears and kiwi, and other fresh fruit may be added depending on availability. Snacks can be salty or sweet, and if you call Tina at 602-246-0672 you can discuss your preference with her. 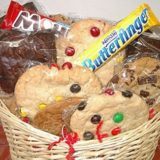 Salty snacks include assorted chips, pretzels and nuts; sweet snacks include assorted candy bars, chocolates and cookies.